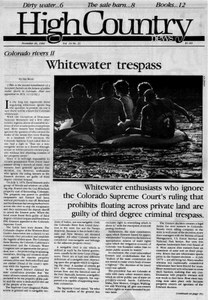 Whitewater enthusiasts who ignore the Colorado Supreme Court's ruling that prohibits floating across private land are guilty of third degree criminal trespass. In some instances, after a storm, the amount of lead in Colorado's South Platte River was up to 10 times higher than state water standards permit. The Council of Energy Resource Tribes board has chosen as its new chairman the leader of a tribe that has opposed energy development.